Setting a Baby Sitting A3 Tri-Fold from the ground up and then adding up content on your own can be quite overwhelming. 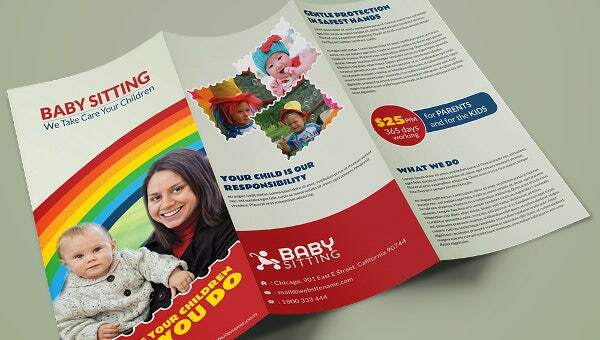 To help you get part of the job done, we have created a unique tri-fold brochure template that you can use to spread the message about your daycare business to parents who need help with their children. The template is high quality, easy to edit and comes with a high resolution of 200 DPI. Quality print is guaranteed. In addition, the template supports three different file formats: Adobe Illustrator, Adobe Photoshop and Corel Draw. The front page has a call to action image, pretty much a summary that speaks what you do to the audience out there.